Com2us on Wednesday announced the release of 9 Innings: Pro Baseball 2009 for iPhone and iPod touch. It’s available from the App Store for $5. 9 Innings: Pro Baseball lets you choose from an exhibition game, tournament or season. You pick whatever team you want and then play ball. 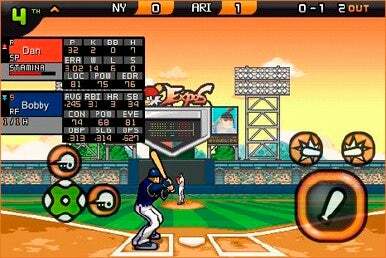 The game lets you take turns at bat and on the pitching mound; you must time your swings when good balls are thrown to hit them farthest; and you have a variety of different pitches to choose from. The more worn out or run down your pitcher is, the wilder his pitches will get. The game includes a variety of stats to track on both batters and pitchers, player conditions and more. You can play in “homerun derby” mode. You can also play as the manager, completing 50 missions to earn points. There are eight managers to play as, and you can upgrade them to strengthen the team. System requirements call for an iPhone or iPod touch running iPhone 2.2 software.